My weight has been out of control for approximately 25 years. Once I had my son (that many years ago), I have never been able to get my weight under 200lbs. NEVER! I am was a "fit fat person". I have been althetic all of my life, but no matter what I tried my outter appearence never matched my inner abilities. This was heart breaking, because people see you -- they just see a fat person. My decision to have weightloss surgery came when I had a physical and discovered that I had high blood pressure. For most African Americans this was normal due to our diet, genes, etc... I would go to the doctor once every 3 months to be tested again, and have my medicines renewed. Until one day when I went back for a followup my doctor told me that my kidneys were having trouble functioning normally due to my blood pressure issues. That I really needed to loose weight! I tried everything I could think of, ie. the pay as you go diets; diet pills; over the counter stuff... 20lbs or so would drop off, but once you stopped the diets all the weight came right back. And let's be honest -- do we really like "not" having control of our own timing when he must go to the bathroom? I didn't! So enough was enough. I began to research online through as many weight loss channels as I could find. Then I hit that famous video site viewing 100's of vids and testimonies -- when I came across a user mentioning BeLiteWeight. He has many videos and explained how having the Gastric Sleeve the best thing that he could've ever done for himself. When I found out that my medical delayed in confirming payment for my surgery, I decided to do it myself. We think of our partners, children, etc...and have a habit of placing ourselves last in our lives. I told myself that it was ok to be selfish this once in my life. I needed this for my health! If I am not healthy, then I can not be here for my family. I went from the airport to the hospital -- had my surgery -- 4 days later I was back at the airport to fly home. I recovered in the comfort of my own home for 2 days and went back to work that Monday. After that, I just had to learn how to treat my new tool (my sleeve). I went from a size 16 to a 4/6*. I now wear Juniors clothing in size S/M. * Everytime I walk by a mirror I have to doublecheck and ask myself "Is that me?" And the most realistic thing that I have ever had to do was to start telling myself "It's ok to like me now! That...it's ok to say, "That is too big -- not too small". With positive thinking this experience all began a new me. I am still physically active and have began my plastics. 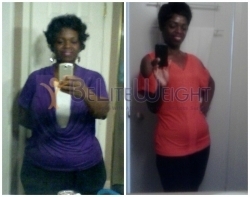 I can't wait to see the new me at the end of 2013! People are really going to be socked!!!! It's ok to love the old and new you! Never let anyone tell you differently. Wishing you much Faith and Success. P.S. I would do it over again 1000xs and still be happy with my results. 5 lbs less tomorrow is better than 10lbs more yesterday! I love my sleeve and work it as the tool that it is... It helps me along every day, every step of the way! Thank you Sleeve for making this possible!!! !